With my simple tips, you can put together a beautiful, elegant, and delicious cheese board for you next party or holiday gathering! I am so in love with cheese, it's not even funny. If I ever became lactose intolerant, I think I'd die. And then I'd cry. A lot. Seriously though, can you develop lactose intolerance? I should know these things. This is serious stuff. My relationship with cheese is a serious matter. Naturally, I am all for cheesy appetizers. Cheesy dips like my Three Cheese Bacon Dip and Greek Yogurt Feta Dip are my some of my favorites! If you are a cheese lover like me, then a cheese board should definitely be on your radar. When you serve a cheese board, the cheese is the star of the show! For years on Thanksgiving, I've served some sliced cheese with pepperoni, salami, and some crackers on the side. It's simple and classic and everyone loves it. It wasn't until recently that I decided to go all out and create a cheese board that really celebrates how much I lurve my cheese -- now I like to make the ULTIMATE cheese board! When you serve some simple and complimentary condiments alongside your favorite cheeses, it takes the sophistication of cheese plate to a whole new level! When I eat my favorite cheese drizzled with a little honey and topped with an almond, the stars align and all is well with the world. If you've been thinking about creating a cheese board for your next party, do it. The best part is, you really can't mess it up. Just choose some cheeses that you like, and try to throw in at least one you've never tried before. Mix it up, have fun with it, and follow my easy tips below to create a beautiful and well-balanced board! Go for al least 3 varieties of cheese of varied hardness. Serve your cheese at room temperature. Some say you should always include a blue, but I'm not into blue cheese, so I skip it! Include something savory for pairing with the cheese. Think roasted tomatoes, olives, fresh herbs or dried meats. You may be skeptical, but always serve something sweet with your cheese. 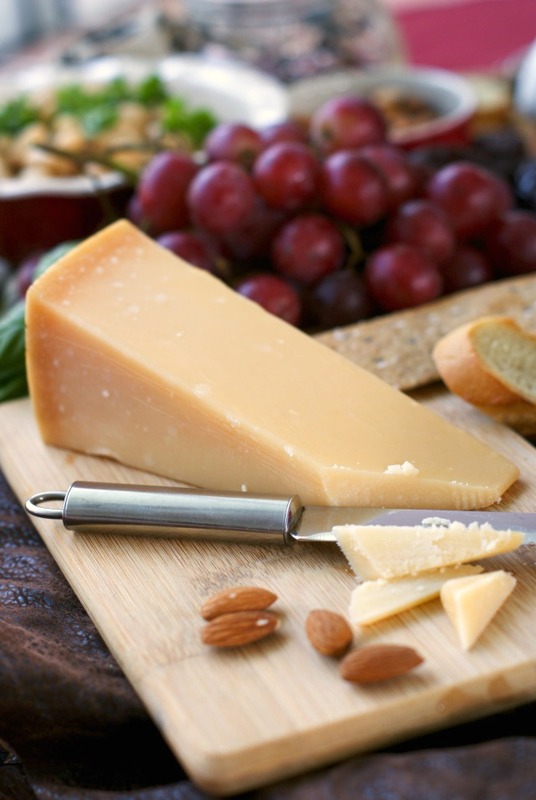 Cheese is great served with dried fruit like dates, fresh fruit like grapes, honey, or fruit preserves. Don't forget to add a little crunch! Nuts are a common cheese pairing. Go for something unexpected! A small dish of olive oil drizzled white beans, a pesto sauce, or a jalapeno jelly will add a bit of flair to your board! Chose at least two varieties of serving vessel for the cheese and toppings. Go for toasted baguette slices and assorted crackers. Start with your board. Choose a large cutting board or serving platter for your base. Add one or two other, smaller cutting boards to add some depth to your presentation. Place the cheese onto the board, leaving space between each variety. 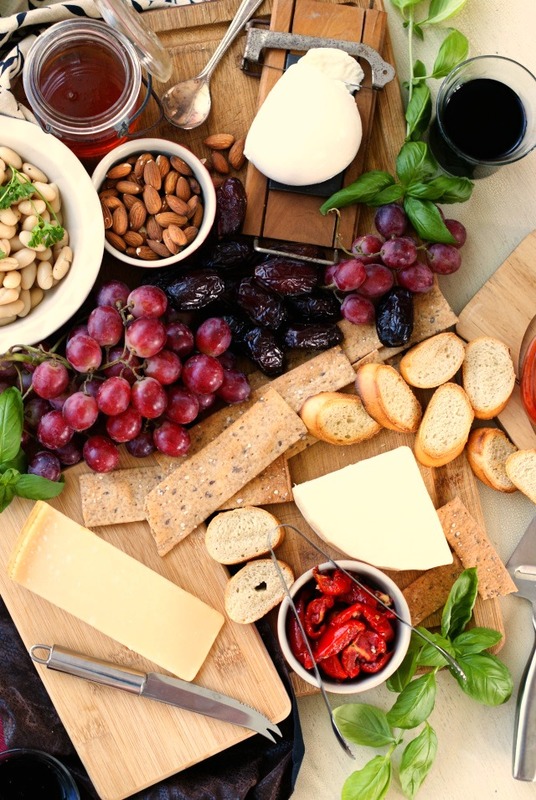 Arrange small dishes with toppings (like roasted tomatoes, nuts, preserves, or olives) around the cheese. 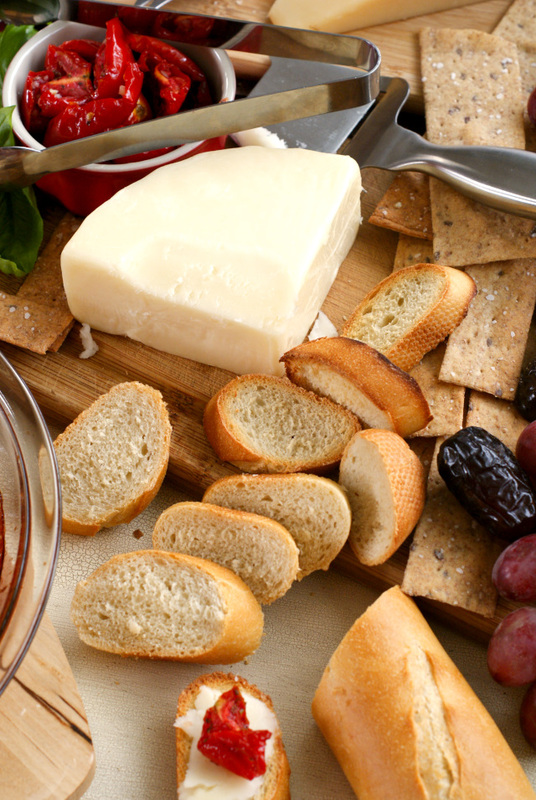 Fill in the spaces between the cheese and dishes with fresh fruit, dried fruit, and small piles of bread and crackers. Add the final touches to your cheese board: add knives, spoons, and forks, cut a few slices of each cheese to make it inviting for your guests to dig in, and label your cheese varieties, if that's your kind of thing! Then, dig in! Pictured: Parmigiano Reggiano, Locatelli Saracino, Buffalo Mozzarella, roasted tomatoes, honey, Medjool dates, grapes, almonds, cannellini beans, multigrain flax crackers, and toasted baguette slices.